Mechanix Wear has expanded their reach from their Daytona 500 racing days over twenty years ago to keeping those needing heavy-duty, industrial strength covered. Wearers benefit from the flexibility of optimal dexterity with their thumb, index and middle fingers freed while protection for remaining fingers is maintained with the unique CG Framer finger-less gloves. Thermal Plastic Rubber (TPR) knuckles and XRD® cushioning in the palms defend against potential injury from impact. The addition of leather reinforced panels and fingertips offers further strength, increasing the lifespan of the glove in areas most susceptible to wear and tear. 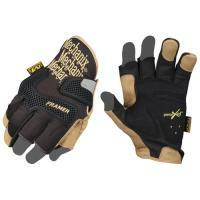 Mechanix Wear's signature TrekDry® material regulates temperature, keeping your hands cool and comfortable during use. Wide-Fit™ hook and loop closures keep gloves secured at the cuffs of your hands.